Ebola has a recent outbreak, the ninth in Congo since the disease was identified in the 1970s. The disease can move from infected animals to humans who come into contact with contaminated blood. Ebola moves from one person to another through contact with infected bodily fluids. It has an incubation period of between two and 21 days, the fatality rate is high. A summary from the World Health Organization issued on May 21 put the number of Ebola patients (including confirmed, probable and suspected cases) at 58 and the number of deaths at 27 — a fatality rate of 46.5 per cent. The current outbreak began in Bikoro, a small lakefront community in a rural area of Equateur province. Two quarantine-escaping Ebola patients were found dead in Congo . 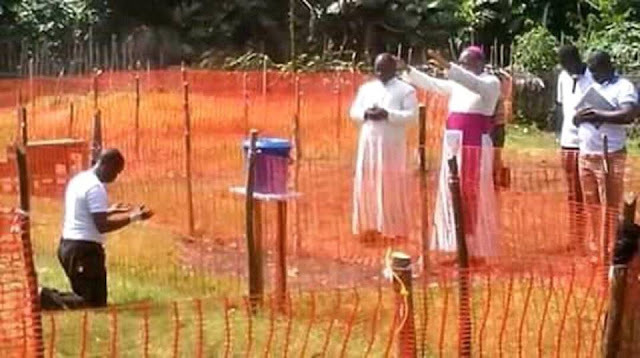 A Catholic priest (pictured above) has also contracted the Ebola virus in the Democratic Republic of Congo. The priest, who has been identified as Fr. Lucien Ambunga, – was reportedly infected in the town of Mbandaka while performing his priestly ministry. The clergyman was pictured receiving blessings from His Bishop and other priests after being quarantined. Ebola is very contagious and deadly. During the 2014-2016 epidemic in West Africa more than 11,000 people died from Ebola.